I’ve been traveling the last few days, and my route has taken me through a few airports. This morning, my flight taxied out into the queue at PHL before the crew gave their obligatory welcome. Including the fact that we were 18th in line for takeoff. Normally, I am a pretty flexible traveler. But today we were already at the point where electronic devices had to be powered down. And – nightmare come true – my only reading material on this flight was stowed in my iPad. That’s right. No book in my purse. No journal to jot down writing notes; those are on the iPad too, these days. I’d already skimmed the in-flight magazine on the first leg of the journey. And there we were, 18th in line. I choked down a wave of panic and reached for the Sky Mall catalog when I saw it: an abandoned copy of Newsweek stuck deep in the seat back pocket. Back in my high school days, getting my own subscription to Newsweek was a self-proclaimed rite of passage. It was the era of Vietnam, Woodstock, Apollo astronauts, Kent State, and Charles Manson. The 72 Olympics were in Munich; the Israeli athletes were murdered., and Mark Spitz clinched a handful of gold medals. I read about it all in Newsweek. After a few letters to the editor, Newsweek held about ten pages of “Newsbeast.” Short articles, including the “World on a Page.” Until this morning I never wondered if India could get to Mars without electricity, or what the French First Lady’s position was on being photographed in a bikini. There was something about a cricket team in Australia too. Not a word about Afghanistan, terrorism, the nuclear threat, energy costs, fracking, or the economy. Features come next. Here, Newsweek offered up the reasons that things are they way they are. Why Obama must go. Why we love being conned. A piece on Syria that ran six pages – probably more than the average reader will bother with. The real Indiana Jones, who does indeed wear a hat. I got to read about Richard Gere’s upcoming role as a “hedge fund magnate.” (In which he fell just short of saying, “I am not a tycoon but I play one in a movie.”) And interestingly enough, I found the term “hedge fund” three times in this single issue, without really looking for it. The last ten pages, called “Omnivore,” comprised the entertainment section. Ten pages of movies, TV, and a piece about the late David Foster Wallace, which implies that of course the erudite reader can recite everything Wallace wrote. 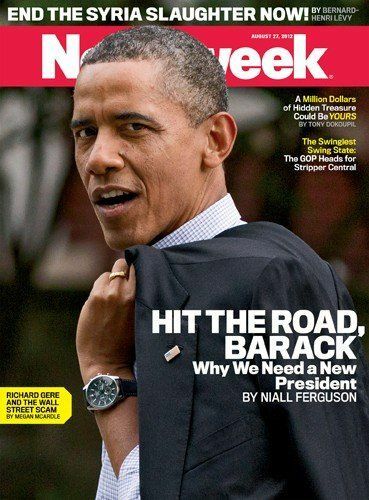 Turns out that the entire Newsweek organization was sold for $1 back in 2010. The purchaser got the magazine plus $47 million in liabilities. Today, I’m glad I didn’t plunk down $5 or so for a copy of Newsweek at the airport news stand. I’m a thrifty sort, and there wasn’t even a buck fifty worth of information behind that cover. I felt a twinge of sadness, though, as I thought back on Newsweek’s glory days. I learned a lot from Newsweek back then.